The anti-cuts group stages its largest protest since the March for the Alternative. The protest group, UK Uncut, yesterday hosted 40 direct actions across the country - the most significant number the group has made since many of its members were arrested outside Fortnum and Mason on the March 26th March for the Alternative. Yesterday's actions were subtitled the "Emergency Operation" on the group's website and were directed against the Coalition's wavering reforms of the NHS headed by Andrew Lansley. One of the first actions to be held left Soho Square at 11am Saturday morning and I accompanied the group from its meeting point to the target of protest in Camden Town. The UK Uncut members - dressed as medical workers, bankers and members of the judiciary - were trailed by several police, in riot vans and on foot, from their meeting point through the London Underground and to the intended target of a Natwest bank branch in Camden Town. Upon arrival, unable to gain access to the bank due to a large police presence blocking the entrance doorway, the protesters acted out set pieces, chanted and handed out leaflets to passers-by on the pavement outside several bank branches in the Camden area for several hours in the central Camden area. 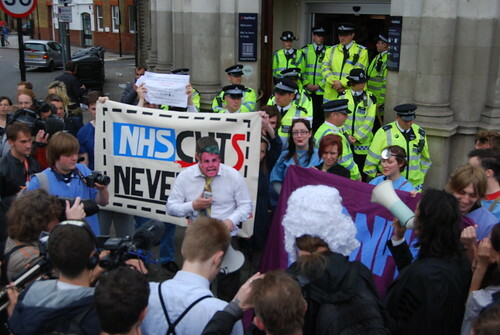 The protest eventually culminated in a mock trial of Andrew Lansley. The Camden event passed off peacefully with no members arrested. Talking to Superintendent Jonathan Morgan, a senior officer who oversaw the police presence at the protest, I was told that if the protesters had entered the bank premises - a tactic frequently used by UK Uncut - they would have been eligible for arrest under section 68 and section 69 of the Criminal Justice and Public Order Act 1994. The use and interpretation of the police powers under this act, first created to deal with public raves in the early nineties, has become an increasingly important and disputed point of detail as the police have sought to deal with UK Uncut's innovative protest methods of occupying banks and businesses that the group accuse of tax avoidance. Other protests in London took place in Islington, Soho and Walthamstow and for further details from all of today's actions from across the country you can view the UK Uncut website.